This two-volume series is a practical learning material for students working in a Chinese working environment. Each volume has ten chapters. Volume One aims to strengthen workplace communication with colleague and boss; Volume Two focuses on handling external affairs. Series consists of a wide range of topics including first day of work, company trip, marketing, customer complaint, layoff and merger and acquisition, etc. Each volume includes a textbook and a teacher’s manual. Each chapter contains dialogue-based question, case study, culture appreciation unit and comprehensive exercise. 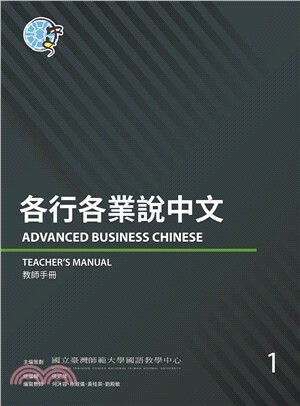 Advanced Business Chinese is suitable for learners who have complete a course in Contemporary Chinese Volume four 《當代中文課程 4》 and Far East Business Chinese Volume three《遠東商務漢語 3》. Such a series covers levels B2 to C1 in the CEFR. l Including dialogue-based question and case study for workplace problem solving. l Including detailed explanation on useful expression. l Including cultural appreciation unit based on Chinese workplace. l Including a synopsis of learning and grammar focuses for each chapter. Everyone needs a wide set of skills to excel at their work. Our editing team has found out that soft skill is more important than any other practical skill for to foreign Chinese learners working in a Chinese workplace. Advanced Business Chinese is to address their demand for knowing how to handle workplace problems in Chinese. To expand their vocabulary bank, we have included scenarios from different sectors, like publishing industry, agriculture industry, manufacturing industry, technology industry, finance and insurance industry, wholesale and retail industry, construction industry, e-commerce industry and so on. This series consists of two volumes and each volume includes ten chapters. Volume One aims to strengthen workplace communication and conflicts with colleague and boss; Volume Two focuses on handling external affairs. Series is comprised of a wide range of topics including first day of work, company trip, marketing, customer complaint, layoff and merger and acquisition. Content of chapters in this volume ( the first volume) bases on simple conversation. Lists of vocabulary and useful expression based on the conversation are included for enhancing students’ sentence complexity. It also has dialogue-based question, case study, culture appreciation unit and comprehensive exercise. This series is well-written: 1. Including dialogue-based question and case study for workplace problem solving. 2. Including detailed explanation on useful expression 3. Including cultural appreciation unit based on Chinese workplace. 4. Including a synopsis of learning and grammar focuses for each chapter. We believe that Advanced Business Chinese helps sharpen students’ communicative skills for solving problem, building relationship with client and colleague, presentation, marketing, negotiation, etc. Advanced Business Chinese is suitable for learners who have complete a course in Contemporary Chinese Volume four 《當代中文課程 4》 and Far East Business Chinese Volume three《遠東商務漢語 3》. Such a series covers levels B2 to C1 in the CEFR. This volume contains 56 useful expressions and around 800 idioms. In such a way, it helps improving learners’ Chinese for work by leaps and bounds.